What Does Carl Sagan's Observation About The Effects of Medicine Really Mean? I started reading Carl Sagan's book The Demon Haunted World based on what I heard about it on Twitter. Of course I was very familiar with his work based on his television persona but none of his writings. Part of the way in, I ran across the above quote as a footnote on page 13. It hit me immediately based both on my personal medical care and also the thousands of people I have assessed over the years. There was also a clear contrast with what is in the popular and professional press. The media has been obsessed with metrics of medical systems for various reasons. First, it is sensational. When they can get a hold of a controversial statistic like the estimated number of people killed by medical interventions every year. Change that to the equivalent number of 757 crashes per year and you have a hot headline. Second, generalizations about the quality of health care lack granularity and precision. There are no epidemiological studies that I am aware of that can even begin to answer the question he asked at the dinner party. From a research standpoint, researching this endpoint would take an unprecedented level of detail. Standard clinical trials, epidemiological studies, and public health statistics look at mortality as an outcome typically of few variables and limited age groups. Nobody publishes any clear data on avoiding mortality - often many times over the course of a lifetime. The same is true about avoided morbidity. Researchers seem focused on binary outcomes - life or death, cured or ill, recovered or permanently disabled. The closest literature seems to be the way that chronic illnesses accumulate over time but that endpoint is not as striking as a mortality endpoint. Every study that I have seen looks at specific cause of mortality or a collection of similar causes and not all possible causes. The best longitudinal data I have found is in a graph in this article in the Lancet (see figure 1). Please inspect this graph at the link and notice the trend in the number of chronic illnesses and how they increase with age. The population studied here was in Scotland. This is very impressive work because as far as my research goes I can find no other graph of chronic illnesses with this level of detail. Data in the US have very crude age groups and the number of chronic illness is often limited. If I look at CMS data for Medicare beneficiaries 34.5% have 0-1 chronic medical conditions, 29.5% have 2-3 conditions, 20.7% have 4 to 5 conditions, and 15.3 have 6+ conditions. By selecting certain age groups the percentages change in the expected directions. For example, looking at beneficiaries less than 65 years of age, 45% have 0-1 conditions and 11.2% have 6+ conditions. Chronic conditions are the most significant part of medical effort and expenditure, but as indicated in Sagan's quote - they are only a part of the medical experience of people across their lifetimes. Now that some previously fatal conditions are being treated as chronic conditions the demarcation between morbidity and mortality is blurred even further. The experience of being treated and cured for a potentially fatal illness is left out of the picture. Being treated and cured from multiple fatal conditions over the course of a lifetime is also not captured. Two common examples are acute appendicitis and acute cholecystitis. These diagnoses alone account for 280,000 appendectomies and 600,000 cholecystectomies each year. The vast majority of those people go on to live normal lives after the surgery. Those surgical treatments are just a portion of the surgery performed each year that is curative and results in no further disability and in many situations the prevention of significant mortality and morbidity. A more complete metric of life saving, disability preventing, and disease course modification would be most useful to determine what works in the long run and where the priorities should be. One way to get at those dimensions would be to look at what I would call the Sagan Index. Since I am sure that there are interests out there licensing and otherwise protecting Carl Sagan's name I am going to use the term Astronomer Index instead - but make no mistake about it - the concept is his. I have included an initial draft of what this index might look like in the supplementary notes below. Higher number correlates with the number of times a life has been saved or disability prevented. Consider the following example - an average guy in his 60s. When I take his history he recalls being hospitalized for anaphylaxis at age 16 and a gangrenous appendix at 19. With the appendectomy he has a Penrose drain in his side and had a complicated hospital stay. He traveled to Africa in his 20's where he got peptic ulcer disease, malaria and 2 additional episodes of anaphylaxis from vaccines that he was allergic to. When he was 42 he had an acute esophageal obstruction and needed an emergency esophagoduodenoscopy. At age 45 he insisted on treatment for hypertension. At 50 he had polysomnography, was diagnosed with obstructive sleep apnea (OSA) and treated with continuous positive airway pressure (CPAP). At age 55 he had multiple episodes of atrial fibrillation and needed to be cardioverted twice. He is on long term medication to prevent atrial fibrillation. At age 60 he had an acute retinal detachment and needed emergency retinal surgery. At age 66 he needed prostate surgery because of prostatic hypertrophy and urinary tract obstruction. Assigning a point for either saving his life or preventing disability would yield a Astronomer Index of 11. In 5 of these situations he was likely dead without medical intervention (3 episodes of anaphylaxis, gangrenous appendix, and acute esophageal obstruction) and in the other six he would be partially blind, acutely ill with a urinary tract obstruction and possible renal failure, experiencing the cardiac side effects (or sudden death) from OSA, or possibly a stroke with disabling neurological deficits from the untreated atrial fibrillation. The index would take all of these situations into account as well as life threatening episodes of psychiatric illness or substance use. Compare the Astronomer Index (AI) to all of the media stories about the number of medical errors that kill people. Preventing medical errors is an essential goal but it really does not give the average person a measure of how many times things go right. When I see stories about how many planes full of people die each year because of medical errors I think of a couple of things. The first is a NEJM article that came out in response to the IOM estimate of people dying from medical errors. It described the progress that had been made and what problems might be associated with the IOM report. The second thing I think of is the tremendous number of saves that I have seen in the patients I treat. I have to take a comprehensive medical history on any new patients that I assess and I have talked with many people who would score very highly on the AI. Another aspect of treatment captured by this index would be the stark reality of medical treatment. The vast majority of people realize this and do not take any type of medical treatment lightly. There is a broad array of responses to these decisions ranging from rational decision making to denying the severity of the problem. Everyone undergoing medical treatment at some point faces a decision with varying degrees of risk. That should be evident from the current television direct-to-consumer pharmaceutical ads that rapidly list the serious side effects including death every time the commercial runs. The decisions that people make also have to answer the serious question of what their life would be like without the treatment and associated risk. There are no risk free treatments as far as I know. In the case of the hypothetical patient, he has taken at least 11 significant risks in consenting to medical and surgical treatment that have paid off by living into his seventh decade. I have not seen any metric like AI applied across the population. Certainly there are many people who make it into their 60s and have fewer problems than in our example but there are also many who have more and actual disability. The available epidemiology of chronic, cured, and partially cured conditions is extremely limited and I don't see anything that comes close to a metric that captures an individuals lifetime experience like the AI index might. The rate of change in the index over the lifespan of the individual and across different populations might provide detailed information important for both prevention and service provision. In terms of psychiatric treatment - a good research question would be the response of people to treatment for psychiatric or substance use disorders with high scores on the index to people with low scores. Is there a potential correlation with cognitive decline? The bottom line for me is that life is hard and most of us sustain considerable damage to our organism over the course of a lifetime. Only a small portion of that is covered in most medical and epidemiological studies. This index might provide the needed detail. It might also provide some perspective on how many times each of us need serious medical treatment over the course of a lifetime. I don't know if they still call it that or not - but back in the day when I was an intern Morning Report was a meeting of all of the admitting residents with the attendings or Chief of Internal Medicine. The goal was to review the admissions from the previous night, the initial management, and the scientific and clinical basis for that management. Depending on where you trained, the relationship between house staff and attendings could be affiliative or antagonistic. In affiliative settings, the attendings would guide the residents in terms of management and the most current research that applied to the condition. In the antagonistic settings, the attendings would ask an endless series of questions until the resident presenting the case either fell silent or excelled. It was extremely difficult to excel because the questions were often of the "guess what I am thinking" nature. The residents who I worked with were all hell bent on excelling. After admitting 10 or 20 patients they would head to the library and try to pull the latest relevant research. They may have only slept 30 minutes the night before but they were ready to match wits with the attendings in the morning. Part of that process was discussing the relevant literature and references. In those days there were often copies of the relevant research and beyond that seminar and research projects that focused on patient care. I still remember having to give seminars on gram negative bacterial meningitis and anaphylaxis. One of my first patients had adenocarcinoma of unknown origin in his humerus and the attending wanted to know what I had read about it two days later. I had a list of 20 references. All of that reading and research required going to a library and pulling the articles in those days. There was no online access. But even when there was - the process among attendings, residents, and medical students has not substantially changed. I was more than a little shocked to hear that process referred to as "intuition based medicine" in a recent opinion piece in the New England Journal of Medicine (1). In this article the authors seem to suggest that there was no evidence based medicine at all. We were all just randomly moving about and hoping to accumulate enough relevant clinical experience over the years so that we could make intuitive decisions about patient care. I have been critical of these weekly opinion pieces in the NEJM for some time, but this one seems to strike an all time low. Not only were the decisions 35 years ago based on the available research, but there were often clinical trials being conducted on active hospital services - something that rarely happens today now that most medicine is under corporate control. Part of the author's premise here is that evidence-based medicine (EBM) was some kind of an advance over intuition-based medicine and now it is clear that it is not all that it is cracked up to be. That premise is clearly wrong because there was never any intuition based medicine before what they demarcate as the EBM period. Secondly, anyone trained in medicine in the last 40 years knew what the problems with EBM were from the outset - there would never be enough clinical trials of adequate size to include the real patients that people were seeing. I didn't have to wait to read all of the negative Cochrane Collaboration studies saying this in their conclusions. I knew this because of my training, especially training in how to research problems relevant to my patients. EBM was always a buzzword that seemed to indicate some hallowed process that the average physician was ignorant of. That is only true if you completely devalue the training of physicians before the glory days of EBM. The authors suggest that interpersonal medicine is what is now needed. In other words the relationship between the physician and patient (and caregivers) and their social context is relevant. Specifically the influence the physician has on these folks. Interpersonal medicine "requires recognition and codification of the skills that enable clinicians to effect change in their patients, and tools for realizing those skills systematically." They see it as the next phase in "expanding the knowledge base in patient care" extending EBM rather than rejecting it. The focus will be on social and behavioral aspects of care rather than just the biophysical. The obvious connection to biopsychosocial models will not be lost on psychiatrists. That is straight out of both interpersonal psychotherapy (Sullivan, Klerman, Weissman, Rounsaville, Chevron) and the model itself by Engel. Are the authors really suggesting that this was also not a focus in the past? Every history and physical form or dictation that I ever had to complete contained a family history section and a social history section. 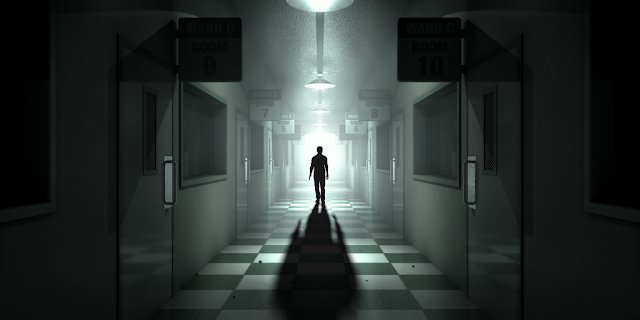 That was true if the patient was a medical-surgical patient or a psychiatric patient. Suggesting that the interpersonal, social, and behavioral aspects of patient care have been omitted is revisionism that is as serious as the idea of intuition based medicine existing before EMB. I don't understand why the authors just can't face the facts and acknowledge the serious problems with EBM and the reasons why it has not lived up to the hype. There needs to be a physician there to figure out what it means and be an active intermediary to protect the patient against the shortfalls of both the treatment and the data. As far as interpersonal medicine goes that has been around as long as I have been practicing as well. Patients do better with a primary care physician and seeing a physician who knows them and cares for them over time. They are more likely to take that physician's advice. Contrary to managed care propaganda (from about the same era as EBM) current health care systems fragment care, make it unaffordable, and waste a huge amount of physician time taking them away from relationships with patients. Their solution is that physicians can be taught to communicate with patients and then measured on patient outcomes. This is basically a managed care process applied to less tangible outcomes than whether a particular medication is started. In other words, it is soft data that it is easier to blame physicians for. In this section they mention that one of the author's works for Press Ganey - a company that markets communication modules to health care providers. I was actually the recipient of such a module that was intended to teach me how to introduce myself to patients. The last time I took that course was in an introductory course to patient interviewing in 1978. I would not have passed the oral boards in psychiatry in 1988 if I did not know how to introduce myself to a patient. And yet here I was in the 21st century taking a mandatory course on how to introduce myself after I have done it tens of thousands of times. I guess I have passed the first step toward the new world of interpersonal medicine. I have boldly stepped beyond evidence based medicine. I hope there is a lot of eye rolling and gasping going on as physicians read this opinion piece. But I am also concerned that there is not. Do younger generations of physicians just accept this fiction as fact? Do they really think that senior physicians are that clueless? Are they all accepting a corporate model where what you learn in medical school is meaningless compared to a watered down corporate approach that contains a tiny fraction of what you know about the subject? It is probably easier to accept all of this revisionist history if you never had to sit across from a dead serious attending at 7AM, present ten cases and the associated literature and then get quizzed on all of that during the next three hours of rounding on patients. 1983-1985. doi: 10.1056/NEJMp1806984. PubMed PMID: 30462934. 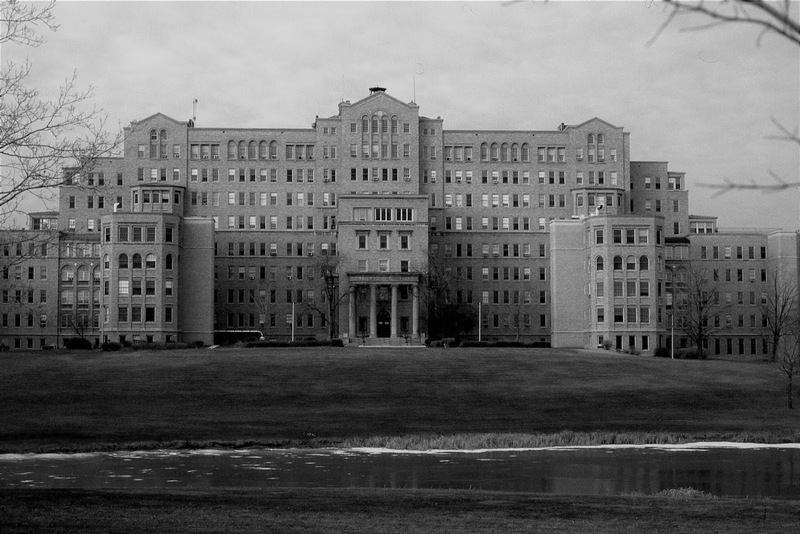 That is the ghost of Milwaukee County General Hospital one of the teaching affiliates of the Medical College of Wisconsin. It was apparently renamed Doyne Hospital long after I attended medical school there. It was demolished in 2001. I shot this with 35mm Ektachrome walking to medical school one day. The medical school was on the other side of this massive hospital. The latest installment of what appears to be an endless debate about whether addiction is a disease or not hit this weeks New England Journal of Medicine in an article entitled "Brain Change in Addiction as Learning and Not Disease." I have looked at a few of the previous articles along the same line that purport to show why addiction is not a disease and it is fairly easy to show that disease or not a disease generally depends on the author's definition and pointing out why the other definitions do not seem to fit. It is basically an exercise in rhetoric. Those approaches invariably end up at quite a distance from opinion polls that illustrate that most of the public and even more medical professionals consider addiction and severe mental illnesses to be diseases. I will come back to the philosophical underpinnings of those polls at the end of this article. In this case the author is essentially making three arguments. Two of the arguments are in side panel graphics and the third argument is in the main text. The first side panel argument (p. 1552) concerns the Brain Disease Model and Stigma. In it the points out that the disease model can be destigmatizing but it also can be stigmatizing to some people. Although I do not agree with some of his premises let us accept that his argument is basically a wash and the people who feel stigmatized and recoil from the prospect of the addiction illness perfectly cancel out those that accept the model are are consoled by it. I recognize that a substantial part of the recovery community base their recovery work on the disease concept of addiction although it is not strictly similar to the biomedical disease that is typically described. This entire panel described a sociocultural model of disease (2). This concept is basically that different societies and the physicians in that society may have diverse views of diseases that vary from other cultures. A secondary factor is that medical recognition may change how that disease has come to be viewed by the society at large. For example, an illness that was once thought be be caused by moral deficiency is seen differently after it is recognized as a process that may be beyond the control of the afflicted person. Mental illness, alcoholism, and addiction are common examples. An associated feature of this model is that this concept cannot be used by the medical field that must concentrate on understanding the biological mechanisms that underlie the disease. The makes this panel irrelevant to a medical disease concept. The second side panel (p 1553) looks at Learning Models and Empowerment. It can also be understood as a sociocultural model. In this panel the author develops a number of arguments to suggest that if people were free of thinking they had a disease they would be more prone to self examination and less dependent on professionals and the need to adhere to what professionals tell them. He suggests that disease mechanisms would lead to pessimism on the part of the person with the problem that would not exist if they were engaged in any number of learning programs to help them recover. He uses the familiar quote that most people recover spontaneously without any help from professionals. This argument depends on a couple of premises that are clearly flawed. The first is the group that is described as having an addiction. The convention I use for that is Volkow's definition of being equivalent to severe DSM-5 substance use disorder in any category. That category has a high level or mortality, comorbidity, and chronicity. In this case the author seems to minimize the interventions used by addiction professionals to "making life-style choices to improve their prognosis." That minimization serves his purpose to suggest that learning is an entirely novel approach to addiction when it has been used for decades. Spontaneous recovery is an often quoted argument against a disease model, when it happens all the time in other conditions (obesity, metabolic syndrome, diabetes mellitus Type II, hypertension). The fact is, spontaneous recovery by any number of conscious interventions does not preclude a disease process. The bulk of the author's argument in the main text is based on illustrating how learning in addiction and normal learning are similar if not identical processes and therefore disease is a learning problem rather than a disease. The most logical way to analyze this argument is to examine the conclusions first. Looking at the conclusion highlights the seriously flawed premises in the author's argument that addiction is not a disease but is just learning. I did not see any qualifiers that addiction is a special case of learning or not. The author's believes that he has developed a "balanced model of addiction" that incorporates various learning mechanisms into what he calls and "embodied cognition model" of addiction. In this model he sees baseline and adaptive biology interacting with the environment to produce the addiction. It is interesting that the key environmental feature of drug use disorders - exposure to the drug is way down his list of other social, cultural and familial factors. Some of his examples illustrate this point. He discusses the socially disadvantaged youth raised in an adverse environment: "These persons tend to find increased meaning in drugs that reduce stress or promote feelings of security and well being especially because these effects can be attained without medication by other people." That does not explain the flood of advantaged white middle class youths who became addicted to heroin and represent a substantial number of overdose deaths. It also does not explain the difference between two inner city youths who have to walk past 3 drug dealers on their way to school each day and one of them becomes addicted and the other does not. One of the important lessons of the current opioid epidemic should be that exposure to a highly addicting drug in biologically predisposed people is one of the central mechanisms of addiction. The authors "addiction spiral" is also problematic. It begins with "early adversity and trauma" as the first step effectively limiting any explanatory power to that population. In step 2, he discusses development changes in the autonomic nervous system that may occur in response to childhood trauma that can lead to hypercortisolemia as an adult. That makes this model appropriate only for adults who have been traumatized as children and even then - only those children with this pathophysiology. There can be a broad range of factors that lead to behavioral inhibition and anxious temperament (3). In step 3, he discusses early childhood adversity as a cause of epigenetic changes that can predispose to addiction. He omits the concept that exposure to compounds like nicotine and other addictive substances are much more potent causes of an array of epigenetic changes and correlate highly with addiction. Kandel and Kandel (4) among others have shown that DNA hyperacetylation from nicotine is associated with cocaine use. Epigenetic changes from drugs of abuse are widespread . A recent study of the impact of smoking on the human genome concluded that as many as one third of genes in the human genome can be affected (5) by methylation of 18,760 statistically significant cytosine-phosphate-guanine sites. In order to claim a more potent learning effect at least an equivalent neurobiology of learning with equivalent impact that it applies across the entire population of people with addictions should be presented. I don't think this paper reaches that threshold. "There is reason to believe that as research progresses, more and more biological processes at all levels of organization will come to be understood as programmed processes." "Disease is a failure of normal functioning." Consider the following vignettes to illustrate that definition. None of the subjects noted had any adverse childhood experiences or pre-existing psychiatric disorders. They all had positive family histories of addiction. Patient 1: 22 year old woman who received hydrocodone after her wisdom teeth were removed at age 20. She received a 14 day prescription and continued to take it even when her pain was gone. At this point she started to acquire opioids from nonmedical sources and eventually switched to heroin for economic reasons and was injecting herself 4-6 times per day. She went to treatment and was placed on buprenorphine-naloxone 16 mg/day. On that dose she had no cravings for opioids and no withdrawal symptoms. Her family has decided to withdrawal support based on considerable expenditures for various therapies that have been ineffective. She goes to a sober house but after a week there learns that there are fentanyl based products available. She leaves the sober house in search of these products. Patient 2: 45 year old man who is an IT professional. His father and grandfather were alcoholics. His grandfather died of cirrhosis. He decided at an early age that he needed to avoid alcohol in order to avoid alcoholism and did well with that strategy until about age 40. At that point professional pressures to socialize with clients lead to some drinking that he escalated at home. He can work from home and his drinking escalated significantly to the point he was drinking a liter a day of vodka that he consumed between 7PM and midnight. This pattern continued for several years until he started to get episodes of alcoholic pancreatitis that required longer and more complex hospitalizations. He tried to stop drinking on his own. He tried online courses that used cognitive behavioral therapy. He went to Rational Recovery and eventually AA. Nothing worked and he knew that every episode of pancreatitis at this point was life threatening. Patient 3: 30 year old carpenter with no previous history of substance use. He was working in a new construction area and found one of his coworkers inhaling paint out of a plastic bag. He tried it and experienced an intense episode of euphoria. That night he went home and found Internet sites where solvent-inhalant users compare their experiences and give tips on usage. He picked up a popular computer duster product and was soon inhaling many cans a day. He eventually crashed his truck while inhaling the solvents and as the police pulled him out of the vehicle - he was still inhaling the solvent. When he was seen in the emergency department he told the physician there that he could not stop using inhalants because: "It felt like pure dopamine was coursing through my veins!" The previous examples are not extreme cases in addiction medicine and addiction psychiatry. They illustrate a failure of normal functioning by compulsive use of a substance despite knowing that this use is irrational and repeated failures to stop. One of the common comments about the majority of people with addiction stopping on their own totally ignores the people being seen in addiction settings. It is this combination of severity, inability to stop despite severe consequences, and chronicity that leads physicians and lay persons alike to consider addiction as a disease. What about the evidence of failure? It can come in various forms. In a standard medical format there is a signature clinical course or phenomenology of the illness. Symptoms can be obvious in a physical or mental status exam. Laboratory testing including chemical and microbiological analyses, electrophysiological studies, imaging studies of various regions and tissues can be undertaken. In all of these determinations the evidence can always be equivocal, false positive, false negative, or truly positive. It often takes a level of expertise to interpret the evidence and a good example is electrocardiography. From a philosophical standpoint the authors in reference 2 point out the initial value of a functional-failure model of disease. It has obvious implications for basic science research of disease mechanisms. That research should be focused on discovering the programming errors in the human organism that results in failure of normal functioning with the hope of understanding the underlying pathophysiology and correcting it. The model clarifies a role for statistics in the disease model specifically the strength of association of certain variables with normal and abnormal functioning as well as ways to analyze tests for those variables. And finally, the concept makes it very clear that the disease in question is real and exists independently of societal biases. I don't think for example that any of the above vignettes could be considered anything less than a failure of normal functioning. In the people addiction specialists treat, there is generally a trajectory of progressive isolation, multiple psychosocial losses, loss of relationships, poverty associated with addiction, and in too many cases - premature death due to the direct or indirect results of addiction. That is the reality and it is captured by disease as a loss of normal functioning. "Most people would think epistemology is always irrelevant to ordinary life, but clearly it isn’t." 2: Albert DA, Munson R, Resnik MD. Reasoning in Medicine: An Introduction to Clinical Inference. Baltimore, Maryland: The Johns Hopkins University Press, 1988: 150-180. 3: Fox AS, Kalin NH. A translational neuroscience approach to understanding the development of social anxiety disorder and its pathophysiology. Am J Psychiatry. 2014 Nov 1;171(11):1162-73. doi: 10.1176/appi.ajp.2014.14040449. Review. PubMed PMID: 25157566. 4: Kandel ER, Kandel DB. A Molecular Basis for Nicotine as a Gateway Drug. The New England journal of medicine. 2014;371(10):932-943. doi:10.1056/NEJMsa1405092. 5: Vaillancourt K, Ernst C, Mash D, Turecki G. DNA Methylation Dynamics and Cocaine in the Brain: Progress and Prospects. Genes (Basel). 2017 May 12;8(5). pii: E138. doi: 10.3390/genes8050138. Review. PubMed PMID: 28498318. My thanks to both Ron Munson and Mike Resnik two of the authors of Reasoning in Medicine - reference 2 above. Further thanks for Ron Munson for the quote at the end of this post and encouragement to explore his ideas about the disease concept. It means a lot to hear from both of these authors at a point when they could have easily ignored me. It is a sign that there are many kind and thoughtful scholars out there. As I type this at 2AM that thought about scholars gives me a warm feeling. The quote used for patient 3 is found on the Internet and used for this hypothetical patient. I have feedback from at least one addiction psychiatrist that the vignettes provided above are realistic and typical of addiction psychiatry practice. I added this on 12/22/2018 when I encountered an excellent example of Wittgenstein's work in Existential Comics. In this case consider the parallel argument about disease or non-disease based on the hot dog versus sandwich argument. What do you think Wittgenstein would say? Existential Comics: Is a Hotdog a Sandwich? A Definitive Study. December 2018.